Wow! What a week for federalism in action. We even saw a bit of verbal argy bargy. It all kicked off last Friday, when Elon Musk from Tesla and Michael Cannon-Brookes from Atlassian started to have a discussion over Twitter about battery storage. The conversation was available to anyone on Twitter and pondered whether Tesla had a battery system that could overcome the power outage problems plaguing South Australia. After a short period of time, Elon Musk tweeted that he could supply a battery system within 100 days or it would be free. This created world-wide news. If you’ve followed the story since then you’ll know that Musk has spoken on the phone to South Australian Premier Jay Weatherill and to Malcolm Turnbull. While Cannon-Brookes has met with Australia’s Chief Scientist Alan Finkel. Everyone was so hopeful. By the middle of this week the mood in Government had soured. On Tuesday Jay Weatherill announced plans for South Australia to build a State owned gas powered generator and a battery storage system. 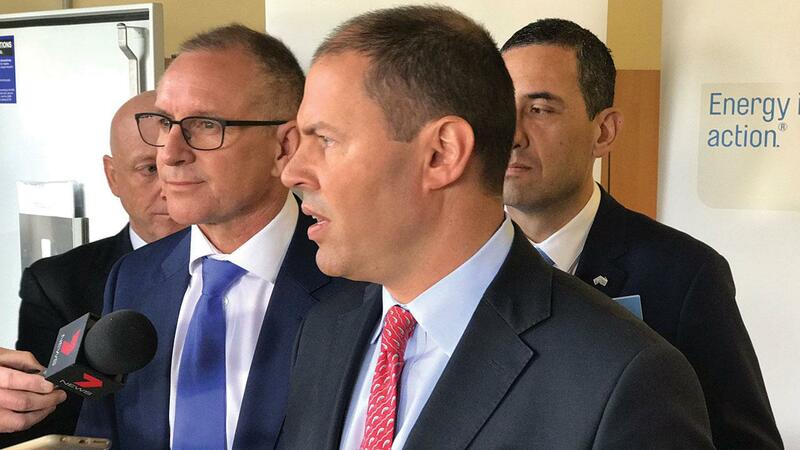 Then yesterday Jay Weatherill and the Federal Energy Minister Josh Frydenberg tried to tear each other apart at a very awkward press conference. Not long after that the Prime Minister officially announced that the Snowy Mountain hydro scheme would be expanded to help power supply problems. The South Australian Premier batted that back, saying that his State needed the power problem fixed by next summer, and that the potential snowy expansion could take seven years. So which level of Government has the power when it comes to power? The powers of the federal government are outlined within the Constitution, mainly in section 51. The Constitution is silent on electricity supply, and anything that is not in the Constitution is meant to be a State power. Electricity is such an essential part of our lives. It would be hard to imagine why this wouldn’t be a federal power. So, why isn’t electricity supply in the Constitution? Electricity supply was a very new thing back when our Constitution was being written. The first city to use electricity commercially was Brisbane in 1882. Tamworth had electric street lighting in 1888, followed by Penrith in 1889. Sydney didn’t get power until after federation in 1904. Each of these local areas generated and used their own power. Mostly, the State Governments were not even involved until well into the second decade of the 20th century. Power supply was something that was administered by the local councils. Some councils produced power themselves, while others went out to the private market right away. Much of our lives these days depends on reliable electricity. And that it was not an important thing when our Constitution was written in the 1890’s highlights the changing nature of our lives. We keep seeing reports saying the electricity market isn’t working. But what is the NEM? From about the 1990’s many of the power generation assets owned by the States were sold off to the private sector. Around that time the National Energy Market was set up. It is run by the Australian Energy Market Operator (AEMO) whose stakeholders include State and federal Governments. The NEM buys and sells electricity in all states and territories except Western Australia and the Northern Territory. It’s a complex system where power generators sell their electricity to the NEM and it is then bought by power retailers and businesses who prefer to buy power from the wholesale market. The way it works is that when power is needed the NEM lets the generators know, the generators then offer to sell power at a price they choose. The NEM buys the power needed at the lowest cost offered. It has been widely reported that this process has not been working as well as it should. One of the South Australian blackouts was caused because the generators didn’t offer to increase their power output to cover the demand that was going to eventuate on a hot afternoon. The South Australian Pelican Point gas power plant stood idle. The NEM had to order load-shedding. This is done to protect the network (the poles and wires) that carry the power from place to place. And then tens of thousands of people were without power. Fortunately, everyone was okay during this blackout. But instances like this do cause problems for business. Apparently back-up generators are doing a roaring trade in South Australia at the moment. It’s called a ‘National’ energy market, but it only covers some of Australia and not every generator is or business is connected to it. Some businesses have set up their own power plants for their own use and other electricity generators sell their power directly to certain businesses (normally large industrial plants or hospitals nearby). What this means is that the NEM already only covers some power. Would a battery plant solve the problems with the market? It’s hard to know. How would a battery farm be connected to the market? To fill up the batteries the power has to come from somewhere. Would they have to buy this power through the NEM? Would the full batteries just sit there until another blackout occurred? Or is it likely that to recoup costs of the battery farm they would have to get into the business of buying and selling power? Buy low, sell high? There has been some commentary this week about how the current pricing structure of the NEM would disadvantage battery farms. This is quite a heated topic and is the cause of a lot of division in Australia. As soon as people start having a conversation about the future of power, the discussion inevitably leads to baseload power. When the wind doesn’t blow and the sun doesn’t shine renewables don’t work, we’re told. When power is needed it is needed instantly. If there is no baseload, like coal or gas, then we might run out of power at times. This has been the strongest argument against renewables in Australia. Now we are being offered a battery solution that has the capability of acting as a baseload source, able to be switched on at any time. Power will still be available when the wind isn’t blowing in the dead of night. How battery farms fit into the current electricity market is not clear. It has been reported that there will need to be some legislative changes. Whether that is State or Federal legislation is not clear. South Australia have stated that they can make the changes through State legislation, while the Feds have threatened to call in the lawyers to check over that. Could these projects give us some hope? When we talk to people about energy we find that most Australians are quite sick of the debate. The debate could be described as a proxy for a wider ideological battle for things such as climate change, emissions trading or intensity schemes and the Paris agreement. But the people just want something to be done so we can have reasonable energy supplies to our homes and businesses at reasonable prices. We want the lights to go on when we flick a switch, but we also understand that things are changing fast. There is a power plant closing down in a few weeks in the Latrobe Valley in Victoria. This area is home to 73,000 people and has over 90% of Australia’s brown coal. Hazelwood is one of three power stations in the area and has been operating for 52 years. It supplies up to 25% of Victoria’s energy needs. At the end of this month it shuts down for good. There are 1000 direct jobs that will be lost. Unemployment in the area is the highest in Victoria and is already at 8.2%. Some of these people have worked in the brown coal industry their whole lives. But many understand the push for a lower carbon future. They just need jobs to replace the ones they have lost. To them this is not an ideological battle. You can watch a forum on SBS’s Insight here, where locals of that area discuss the closure of the power station. One respondent discusses the loss of hope in the area since the privatisation in the 1990’s. Another worker from Hazelwood who will soon lose his job thinks that power generation should be returned back to the state from the private businesses. Could the Federal and State Governments, working together find a solution, give some hope back to these people? Last week when we were writing about our country’s name the “Commonwealth of Australia” we were taking notice of instances where ordinary Australians were acting for the common good of Australia. One of these stories was on the ABC’s 7.30, where a sugar cane grower’s power bills had increased to such a degree that he had installed a diesel power generator on his property to save costs. He was not inclined to completely go off grid as he understood that by doing this the power prices would go up for his neighbours. But if power prices keep going up and up, and it’s not guaranteed that you’ll have power when you need it, then people who don’t have trust in the system will look for other options. There are periods in time when civilisation goes through big changes. Examples include the enlightenment period and the industrial revolution. There were detractors during these times, whether these people were somehow invested in the old way of doing things or a bit frightened of change. But it didn’t matter how many looms were smashed, these revolutions still happened. Some commentators have stated that electricity is now going through a technological revolution. The old way of doing things might be swept aside by batteries. Before now, the power you use when you turn on a light has been generated for your immediate use. This means we need some way of generating power all the time. But if we can find a way of holding onto power and using it later, it’s a big technological jump forward for the way we produce and use power. Governments and people from all around the world are watching what is happening with batteries in South Australia. Can batteries be installed on large scale? What other technological changes have to occur? Can the network cope? These Governments may then look at whether this can be done in their own countries. The South Australian Government on Wednesday released a tender for a battery facility to be built. It closes in two weeks. They want this up and running by the end of the year to avoid summer blackouts next season. The world won’t have to wait long to see what we can do. Before federation, local councils ran the power networks. By 1920 most State Governments were generating and distributing power to the people. By the late 1990’s State Governments were beginning to privatise power generation and the networks. This is when the federal government took on a role with the National Energy Market along with the States. Now the States (well at least South Australia) don’t think this market is working. South Australia is taking their power back. But as we saw at that press conference yesterday, it’s not going be without a fight with the Commonwealth. When the Constitution was written, the federal Government was given only specific powers. It was intended that the States would hold much of the power within the federation. However, over time with the foreign affairs power and taxation, the Federal Government has become what the people who wrote our Constitution were worried about: the rich uncle to the States. Many Australians believe that the Federal Government has more power than the States and whether or not that is the case can be argued. What we do know is that our federation works better when the different levels of Government work together.